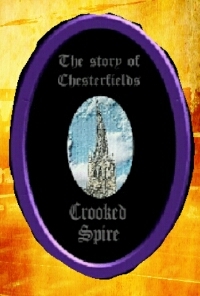 For tickets that may help you get here see. One of these may or may not be the best way of getting here for you. 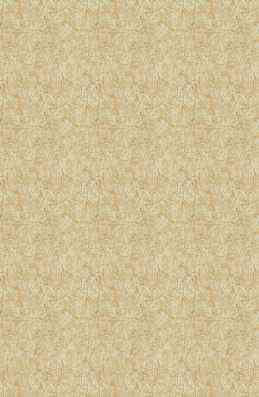 This is a very easy to follow and on the whole flat walk. 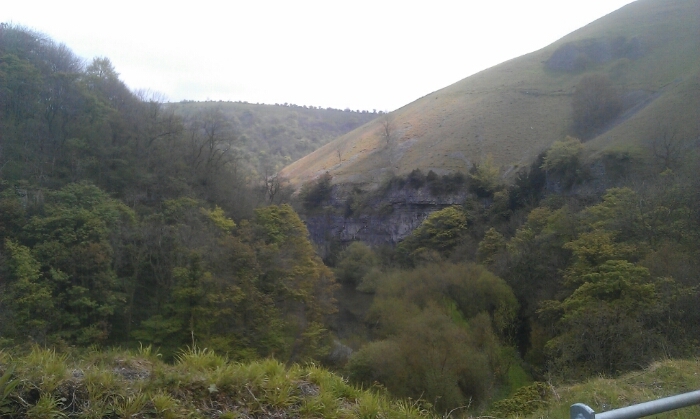 Most of the route follows the trackbed of what used to be part of the midland mainline route from London St Pancras to Manchester through the spectacular limestone dales of the Derbyshire peak district. 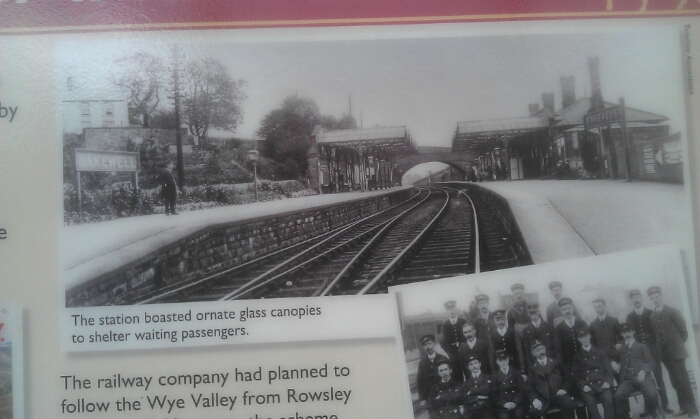 The railway shut in 1968 thanks to Doctor Beeching. 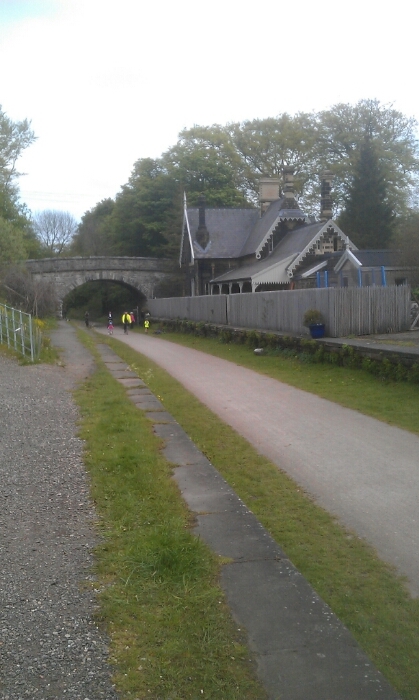 To get some idea what this railway may have been like today if it had stayed open visit my Train ride from Leeds to Carlisle this uses the Settle to Carlisle line the Midlands route from London St Pancras to Scotland passing through the beautiful scenery of the North Pennines. 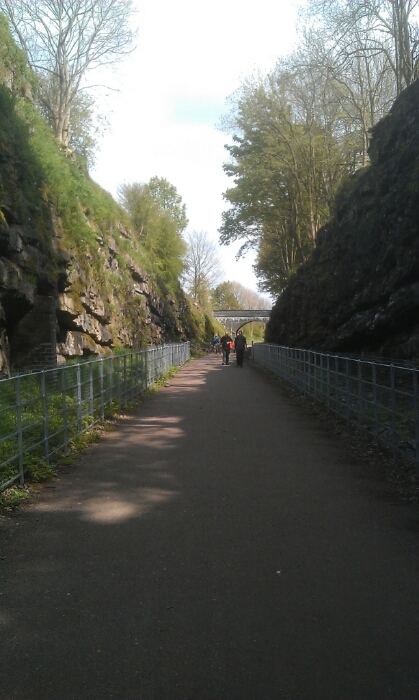 Some of the structures and works along the route bear a striking resemblance to those found on the Monsal trail. From Sheffield take the bus to Millers Dale this is currently the number 65 Sheffield to Buxton bus as of May 2012 visit Traveline for details. Also for a detailed and and pictorial description of this route visit A scenic bus ride from Sheffield to Buxton on my sister site the Last Bus Stop. 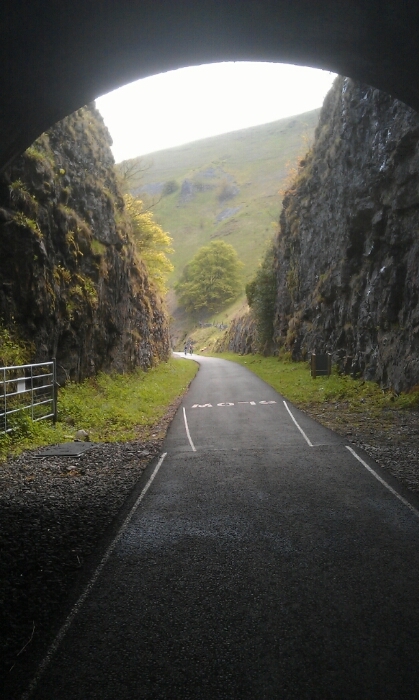 Alight from the bus at Millers dale just after you have passed under the big viaduct. 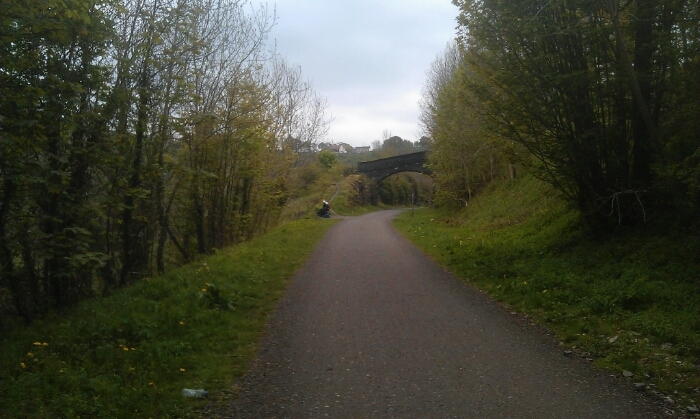 Cross over the road and walk up the lane take the first path on the left and go up the steps up the hillside. 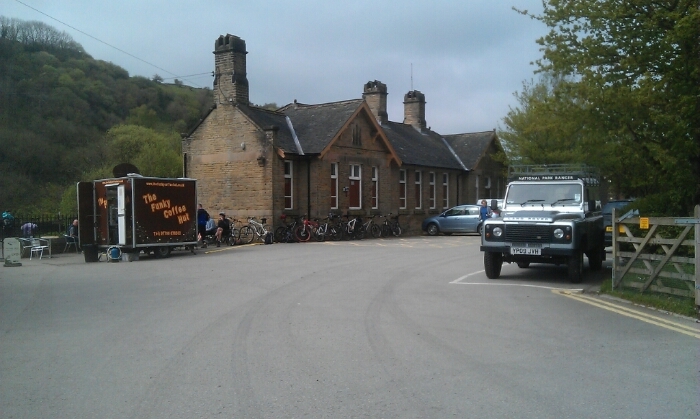 This will bring you out onto the Monsal trail turn right amd you will come to the site of the Millers Dale Station this was once the Junction station for the Buxton branch. 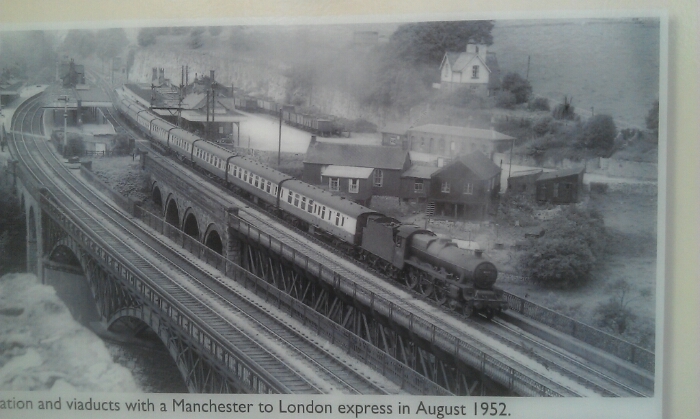 A Manchester to London St Pancras Express passes through Millers Dale station in 1952 note the 2 large viaducts. 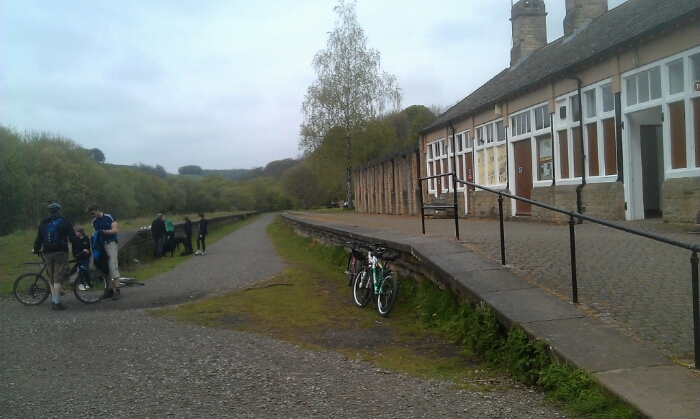 From the old station follow the Monsal trail across the old viaduct Bakewell is clearly signed and the way ahead is obvious following the old trackbed so just enjoy the photos making a wrong turn is almost impossible. 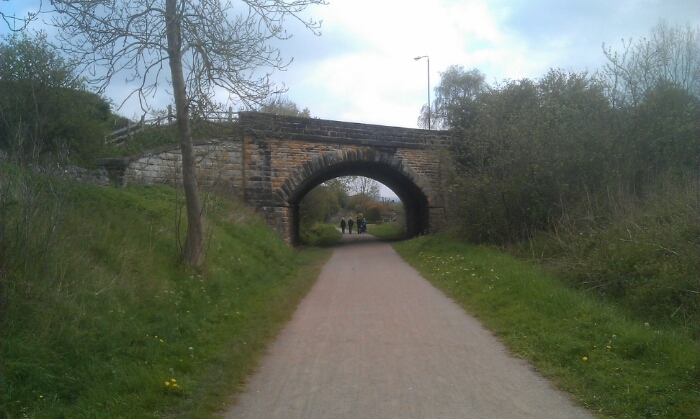 You are now on the walking equivalent to a motoway. 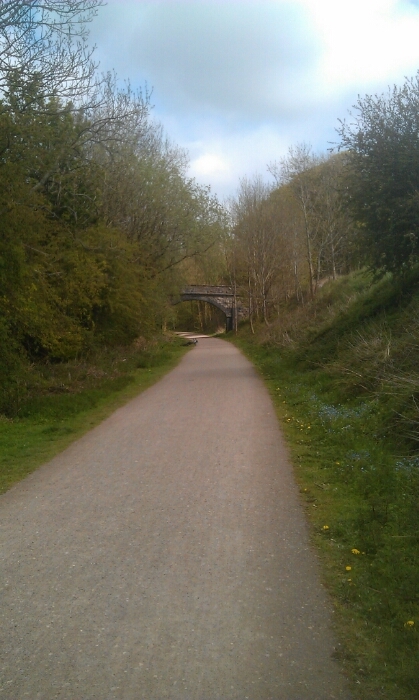 The way ahead over the used viaduct at Millers dale. 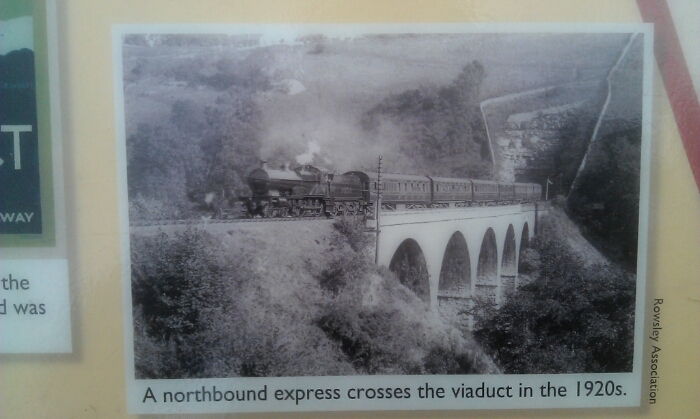 To see a very unusual view of the underneath of this viaduct visit A scenic bus ride from Sheffield to Buxton. 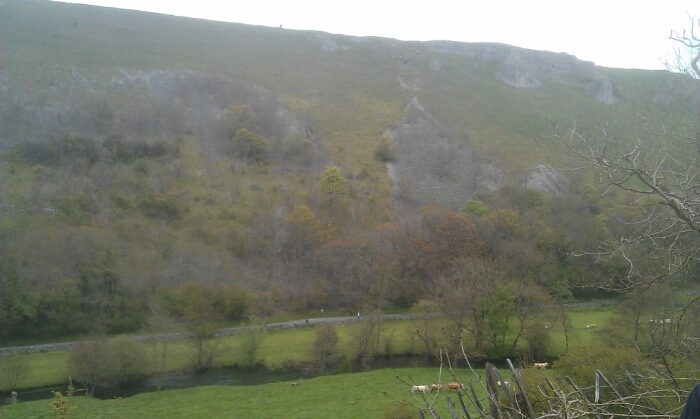 Part 2 Tideswell to Buxton. 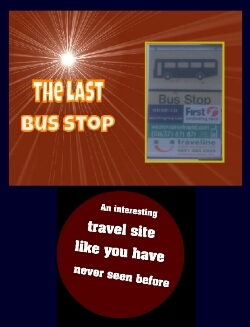 on my sister site the Last Bus Stop. 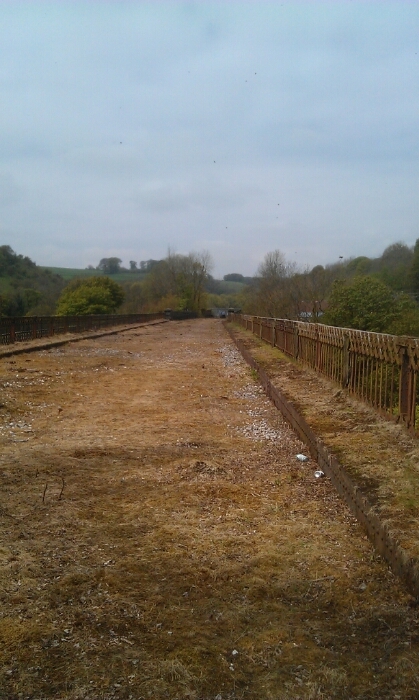 Looking back towards Millers Dale on the disused viaduct on which the train was seen in the earlier shot. 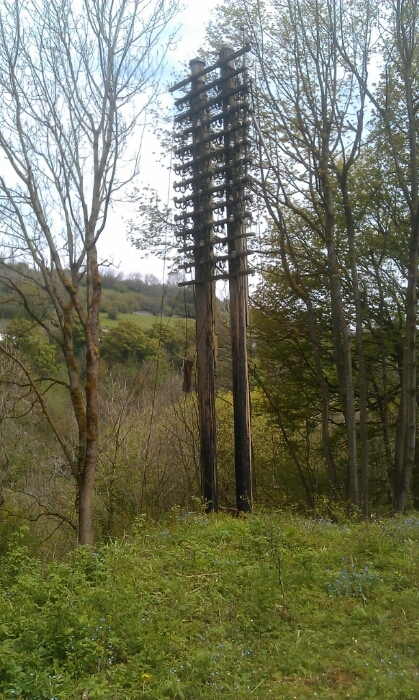 An unusual sight a long since defunct telegraph pole grom a bygone age just after the viaduct hard to believe this was once state of the art communication. At least in those days there was no signal to worry about. The first of many cuttings. 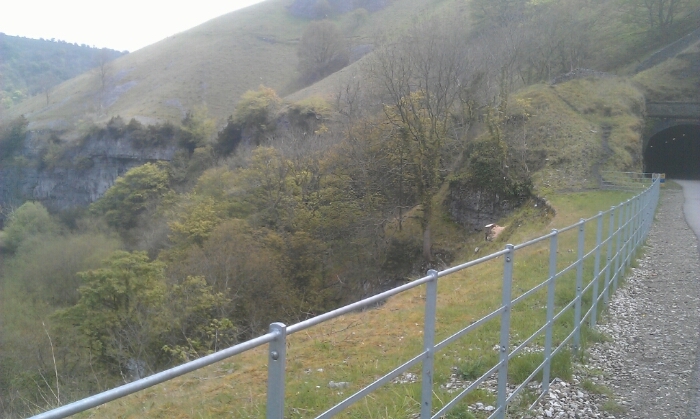 Another view from the trackbed near Litton . 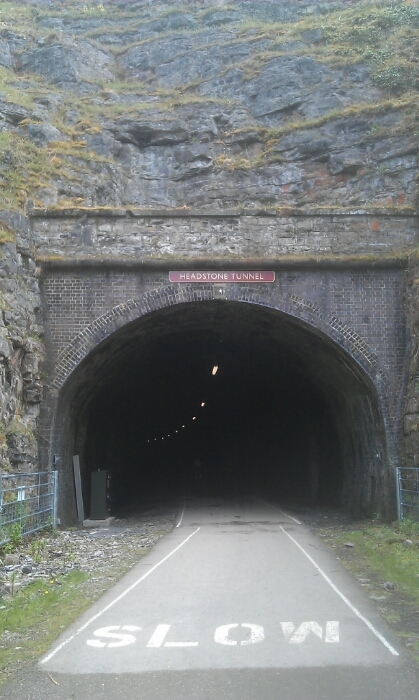 The approach to Litton tunnel. 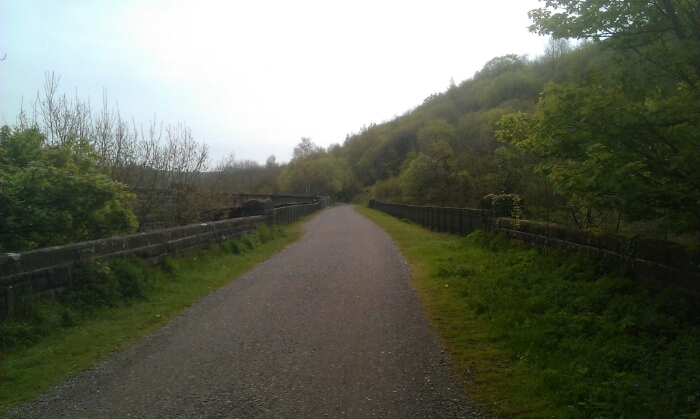 As I commented you are on the motorway of walking this path goes straight through the hills rather than having to walk over them or round them.Having said that if you follow the old route of the Monsal trail before the tunnels were opened up to the public it is an attractive walk. 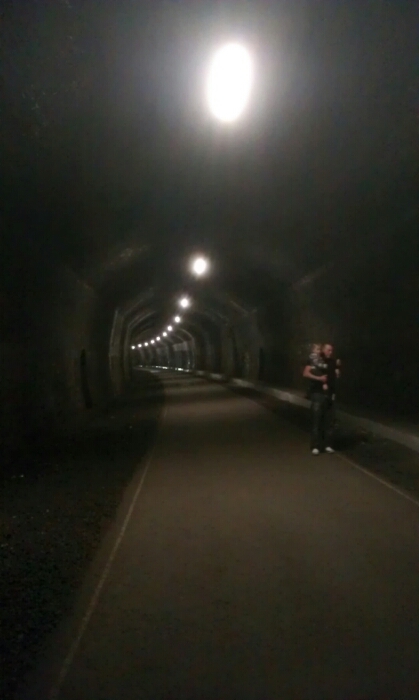 As you enter the tunnel you enter a different world the air becomes cooler and the whole atmosphere changes. 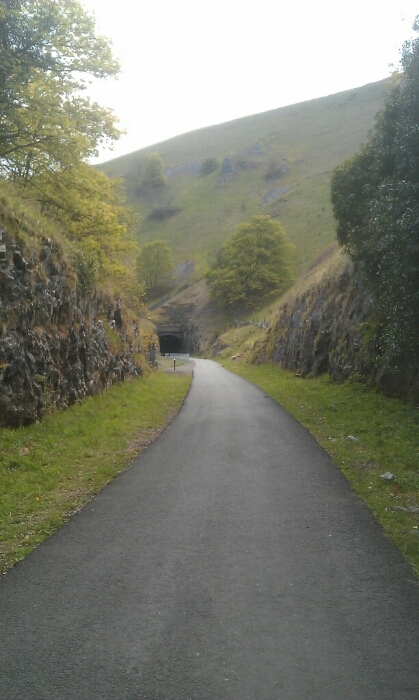 The way forward thtough Litton tunnel. 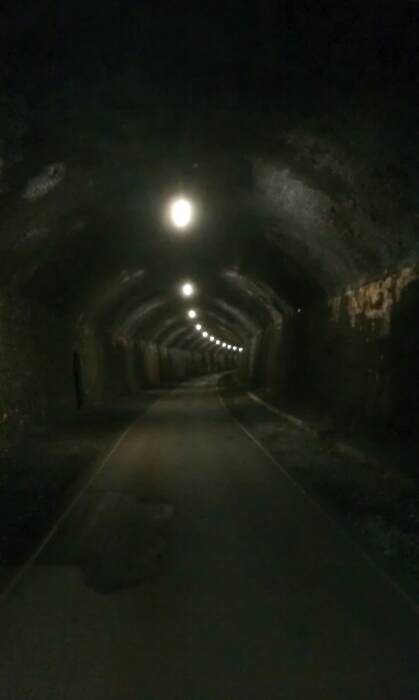 The aurhor inside Litton tunnel. 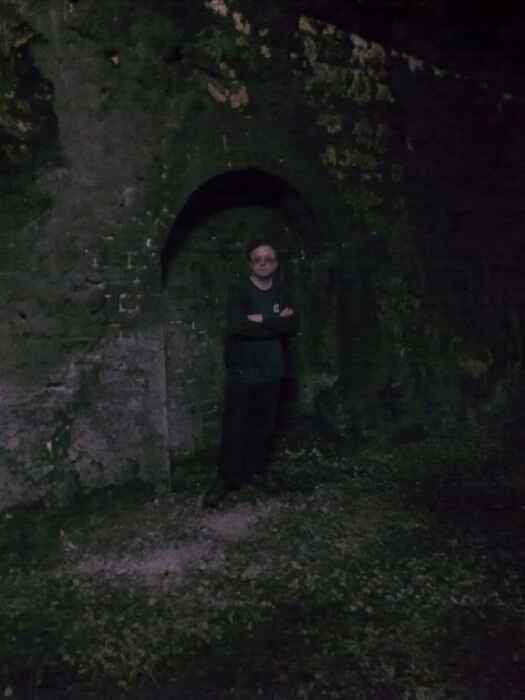 The author in a manhole pherhaps I thought a train eas comeing, the light plays funny. tricks. 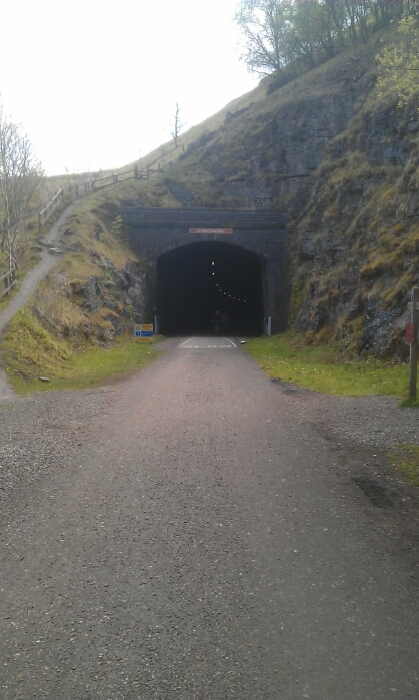 A view once reserved for train drivers only at one time leaving Litton tunnel. 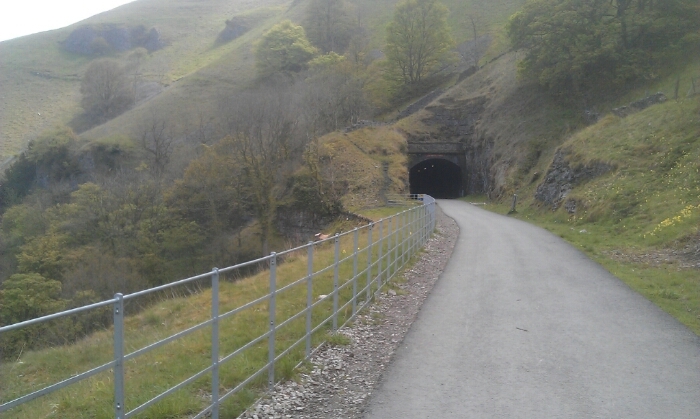 And just round the corner Cressbrook tunnel. View over Cressbroodkdale between the two tunnels hard to believe until 1968 you could have seen this view and some of the others out of window of a London bound express. 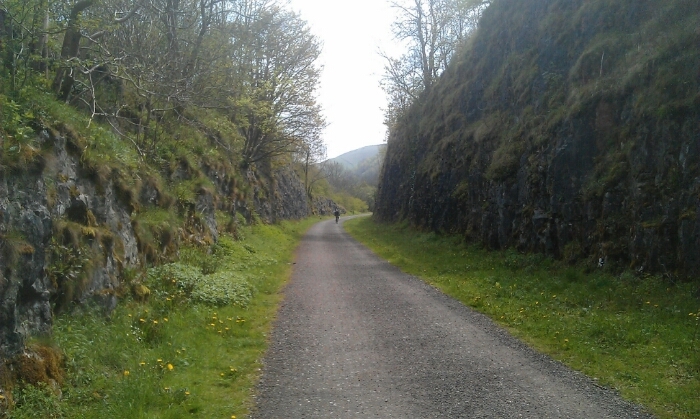 These 2 pictures just give some idea about how spectacular this part of the walk is and how the victorian railway builders carved the railway into the hillside. 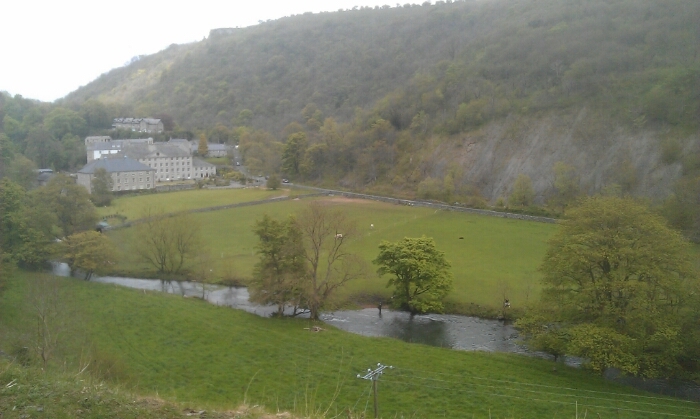 Looking back at Cressbrook mill once you leave the tunnel. 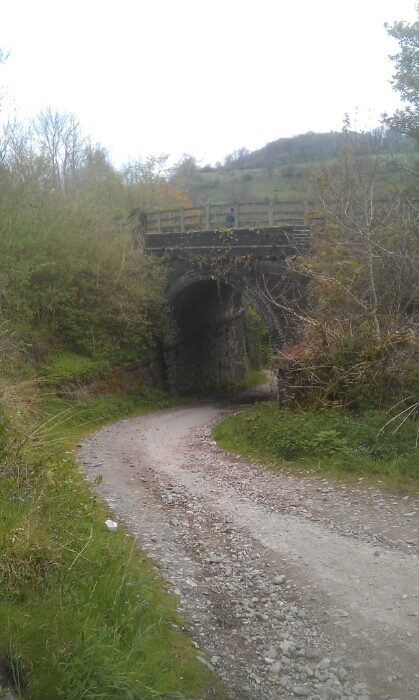 Bridge over the lane leading up to Monsal Dale staition . 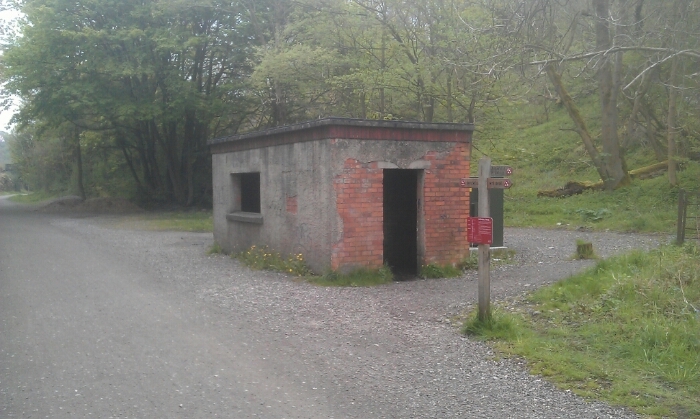 Workmans hut at Monsal Dale. 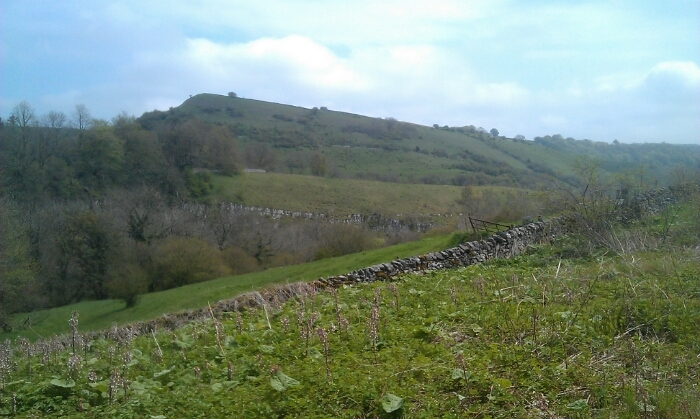 View across Monsal Dale from the trackbed. 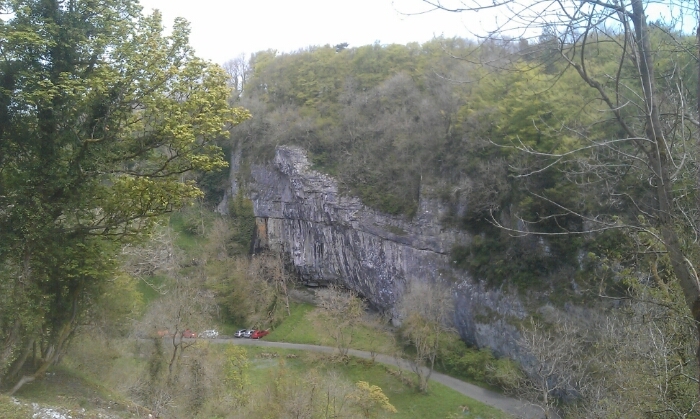 Looking across the Monsal viaduct towards Headstone tunnel. A train crosses the Monsal viaduct in the 1920's. 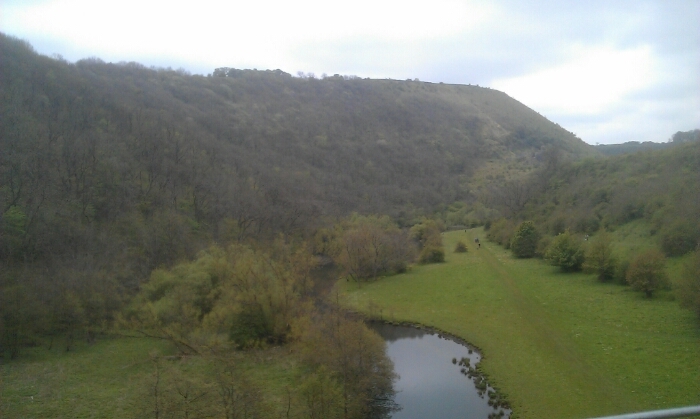 View from the Monsal Viaduct. 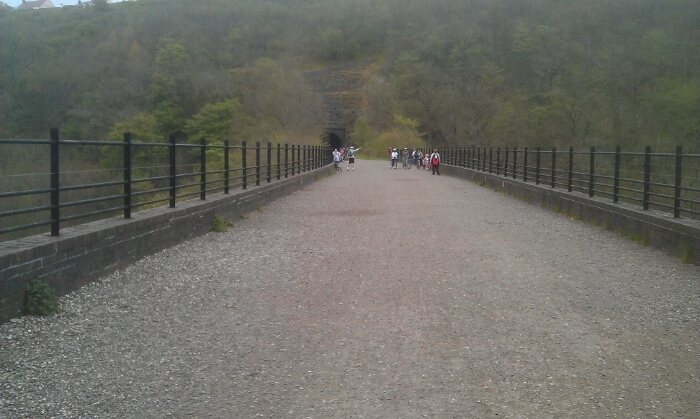 At this point just at the end of the viaduct at the mouth of the tunnel you may take the path on your left and follow it up the hill to Monsal Head where there is a pub, cafe and often ice cream vans. 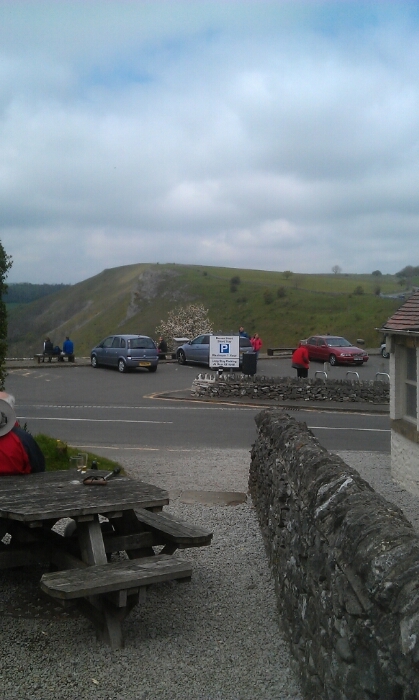 This is a popular spot with tourists, walkers, bikers etc. 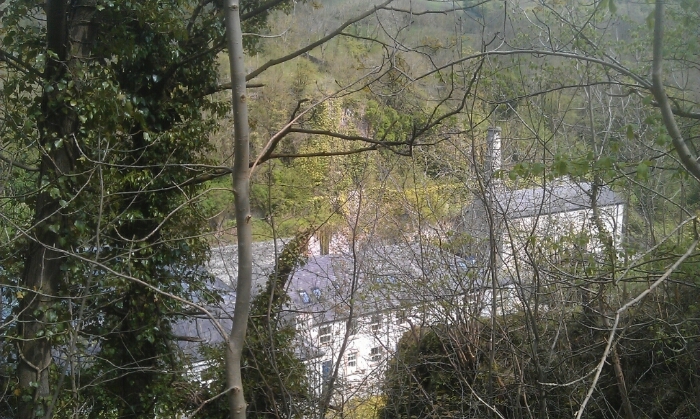 This is a short but steep walk. The view alone makes it well worth while . 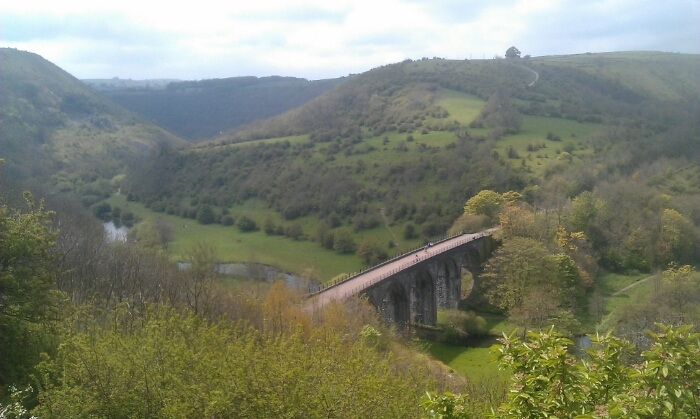 One of the most famous views in the Derbyshire Peak District view of the Monsal Viaduct from Monsal Head. 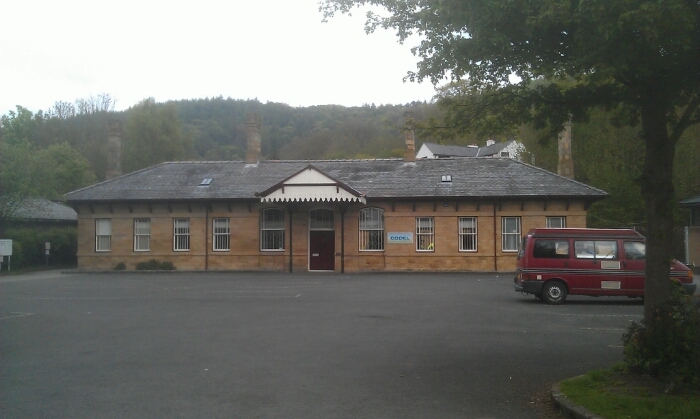 View from the Stables bar. When you are ready follow the same path you came on back to the trail. 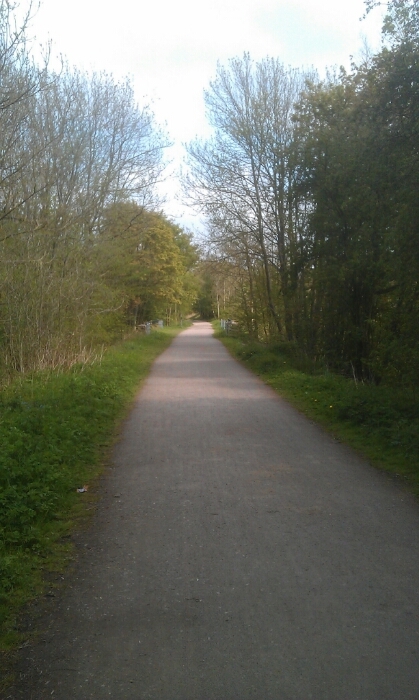 You are now about halfway along the walk. 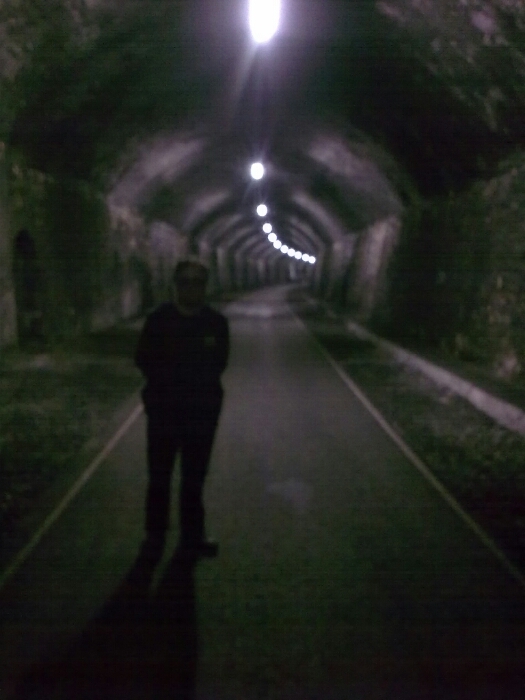 Take a left and head into Headstone tunnel. 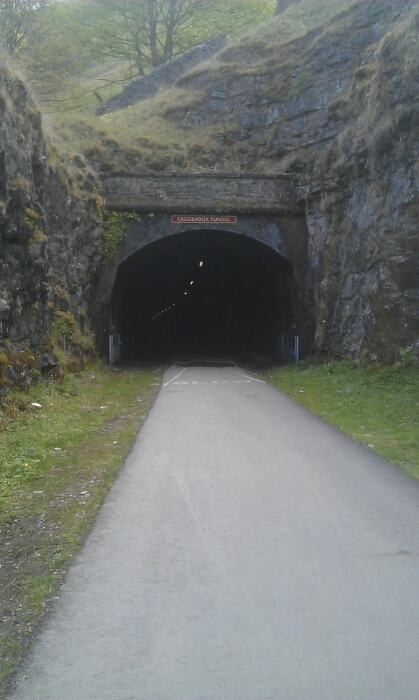 The route after Headsone tunnel. 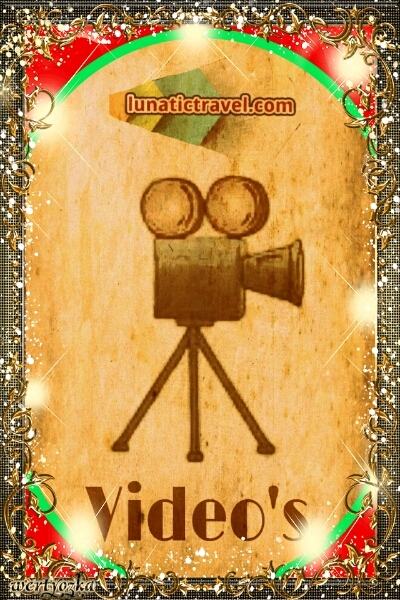 While the scenery is still pleasent it becones far less dramatic. 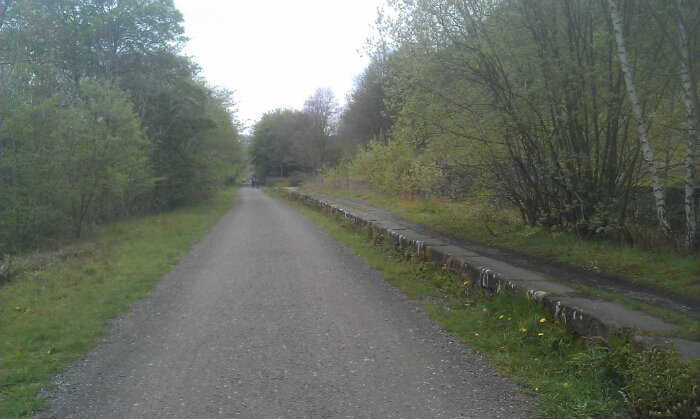 The old Longstone for Ashford station. 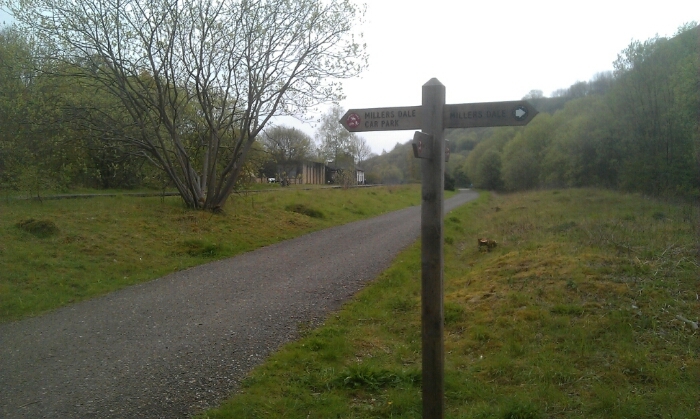 The route on towards Hassop. 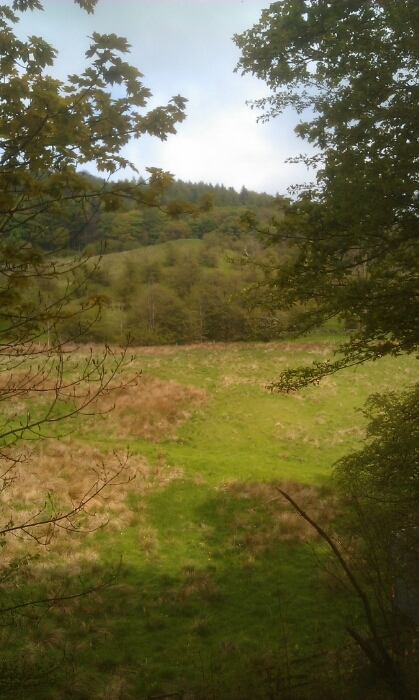 The landcape is still attractive near Hassop. 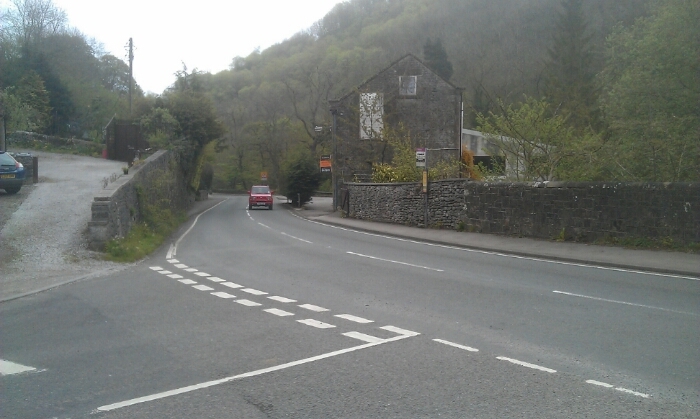 Crossing the Ashford In The Water to Hassop road. 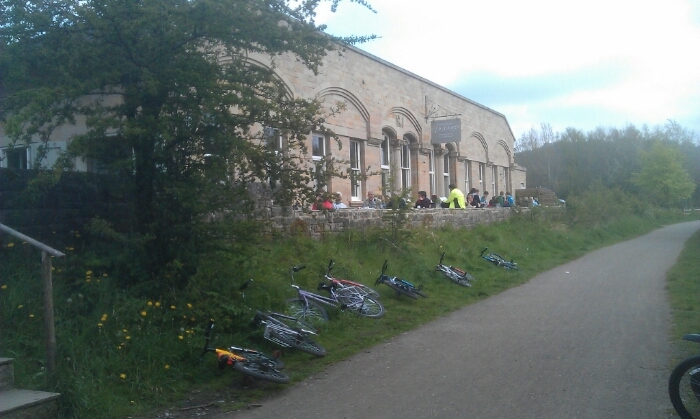 Hassop Station, there is a cafe, bookshop and cycle hire available here. 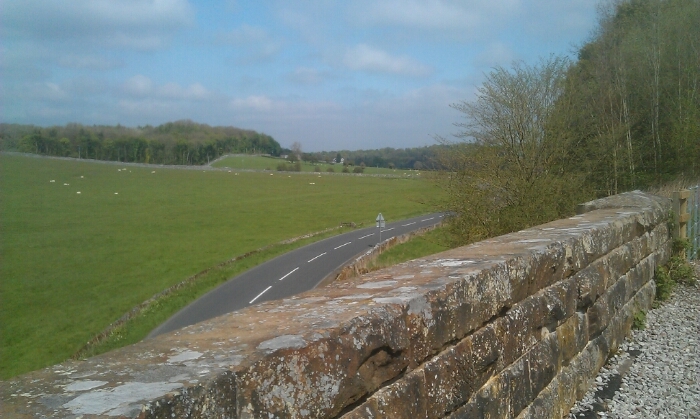 Passing under the main Baslow to Bakewell road on the outskirts of Bakewell. 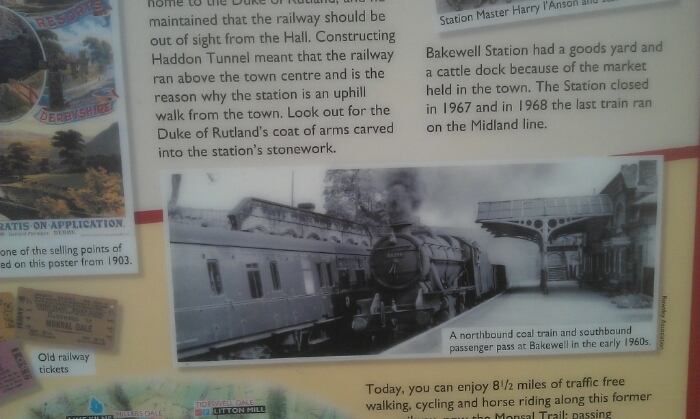 Bakewell station in the early 1960's. 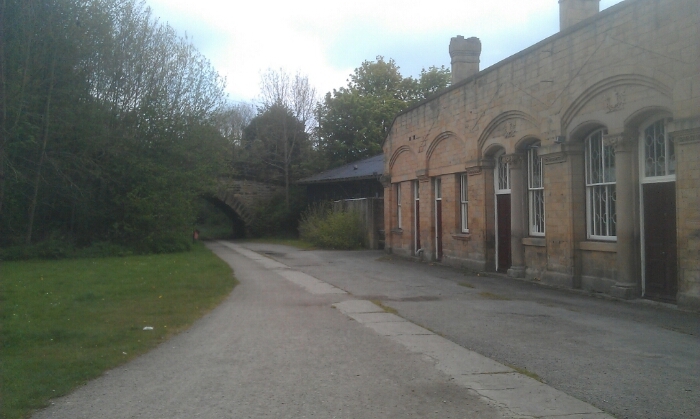 Bakewell station as it was. 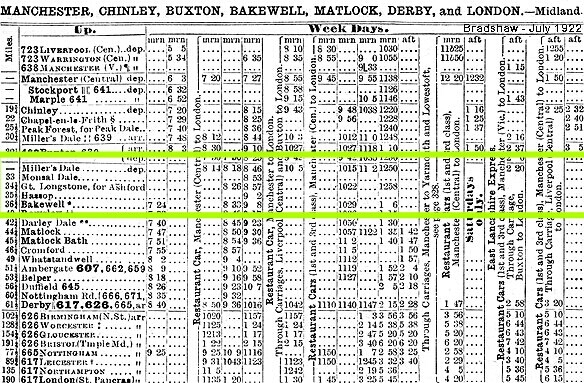 Interestingly if you had made the journey by train from Millers Dale to Bakewell it would have taken 15 to just over 20 minutes see above timetable from 1922. The part of the timetable that shows this is within the green box. 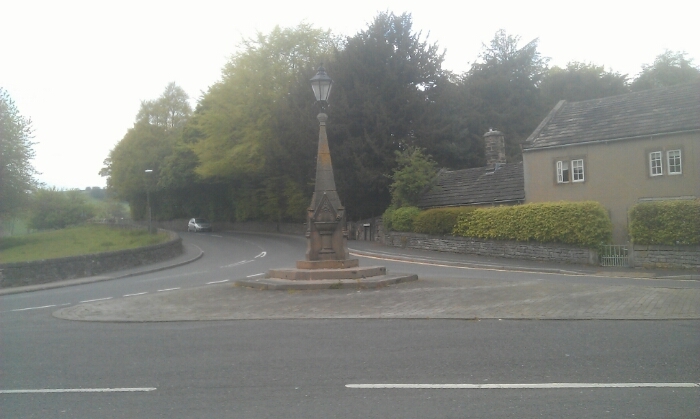 Once at the Station turn right and past the front of station to the road turn right and down the hill when the main road is reached turn left accross the bridge into the centre of Bakewell. 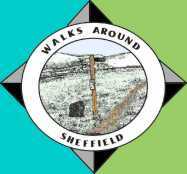 From here there are busses back to Sheffield and various other places visit Traveline for details. There are also buses to Derby Buxton Stocport and Manchester from Bakewell see the pdf timetable below for details. 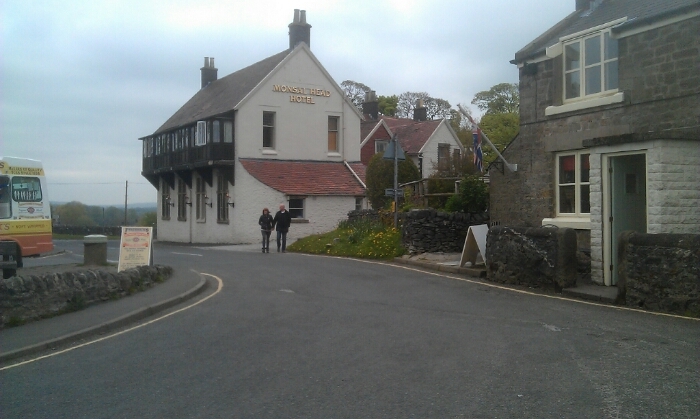 There are pubs, cafes and chip shops availiable here if you are in need of refreshments. Bakewell the junction with the main road. 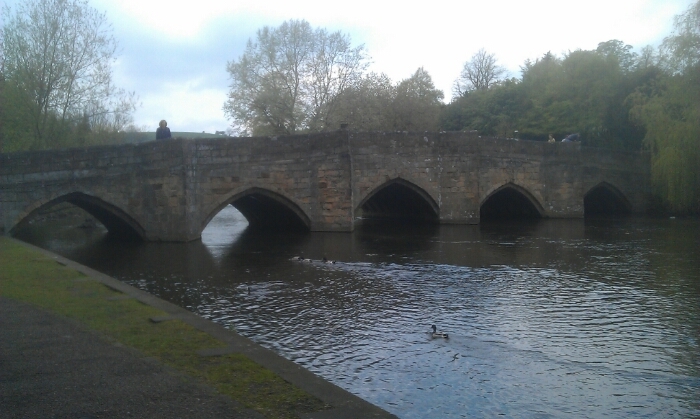 The bridge over the river Wye at Bakewell. 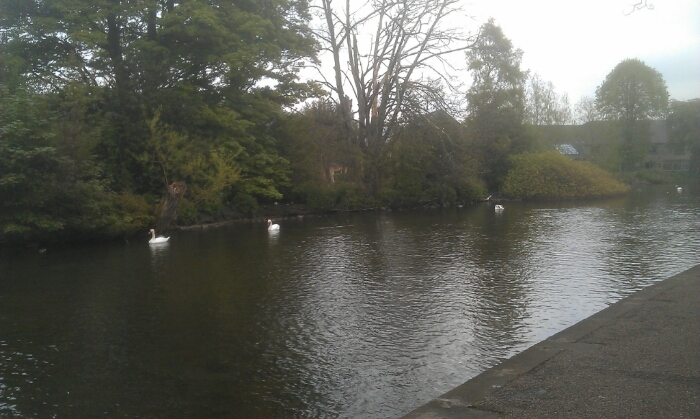 The river Wye at Bakewell.